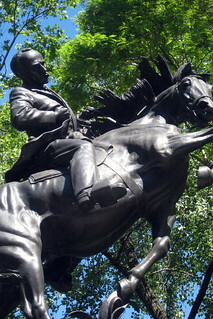 Sculptor Anna Vaughn Hyatt Huntington created this larger-than-life bronze equestrian statue depicting Cuban patriot and author José Martí. Hyatt Huntington also created the Joan of Arc bronze equestrian sculpture in Manhattan’s Riverside Park (1915). Her last major work, Hyatt Huntington executed this piece at age 82, and presented the statue as a gift to the Cuban government for presentation to the people of New York City. The Cuban government donated the monument’s dark granite pedestal, which was designed by the architectural firm of Clarke & Rapuano. Martí campaigned for the liberation of Cuba from Spain and was imprisoned by Spanish authorities in 1868. Fleeing to New York in 1880, he continued to advocate for Cuban freedom while in exile and organized the Cuban Revolutionary Party in 1892. Martí returned to Cuba in 1895, at the beginning of Cuba’s successful fight for independence. The monument depicts a reeling yet resolute Martí after being fatally wounded while atop his horse during the 1895 battle at Dos Rios. Although the statue was completed in 1959, the political climate between pro- and anti-Castro elements in New York necessitated the delay of the monument’s unveiling until 1965. The piece is one of a trio of bronze equestrian sculptures representing Latin-American leaders that greet visitors to Central Park at the north end of Avenue of the Americas, which was named in 1945 at the suggestion of Mayor Fiorello H. LaGuardia to honor Pan-American ideals and principles. Following the renaming of Sixth Avenue, a new plaza was designed where the avenue meets Central Park, and the monument of Simon Bolivar was moved to the eastern side of the plaza and rededicated. A month later the statue of Argentine general José de San Martín was unveiled on the west side of the plaza, and in 1965, the Marti monument was dedicated between the two earlier works. The Central Park Conservancy conserved the Martí monument in 1992 using funds raised by Cuban-Americans from throughout the United States. Central Park was designated a scenic landmark by the New York City Landmarks Preservation Commission in 1974.